The Chicago Riverwalk is an open, pedestrian waterfront located on the south bank of the main branch of the Chicago River in downtown Chicago, Illinois. It spans from Lake Shore Drive to Lake Street. 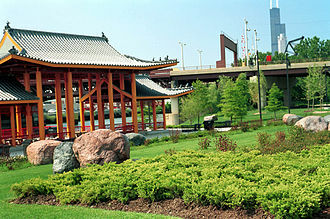 Called the city's 'Second Lakefront', the Riverwalk contains restaurants, park-seating, boat rentals, and other activities. Its current and planned final extent was opened to Wolf Point in 2017. In conjunction with the Chicago Department of Transportation, construction of the Riverwalk began in 2001 as an extension of the Wacker Drive reconstruction project. With the rebuilding of Wacker Drive, the street was purposely relocated to allow for development of the walk. The oldest section now called Market, between Lake Shore Drive and Michigan Avenue was at first an extension of the lake shore trail with tour boat docks, concessions and stair access. Sections at first required going up to street and bridge level to access the next section, until design plans and funding could be arranged over time. The plan developed by architects at Skidmore, Owings and Merrill called for four separate districts within the riverwalk: Confluence, Arcade, Civic and Market, all with a specific location and theme in mind. Confluence: Located where the Main, North and South branches of the River intersect. Previously the location of taverns, hotels and convention centers, it is now a major intersection of not only the River but the neighborhoods that border it. This area of the Riverwalk was expanded fifty feet into the river for the installation of park space and pedestrian access to Upper Wacker Drive as well as various amenities located in this area. Arcade: The District spanning east from Franklin to State Street. It is called the "Arcade" because of the architectural detailing that separates the riverfront from the rest of the Wacker Drive. Civic: The District spanning east from Dearborn St. to Michigan Ave. It includes the Chicago Bridgehouse Museum, located at Michigan Ave. and Wacker Dr., and is also the focal point for visitor and tourist activities, primarily for the boat launches. The Trump International Tower and Hotel is also located along this stretch of the Riverwalk, as well as notable landmarks such as the Wrigley Building and the Tribune Tower. Market: The District spanning from Columbus Dr. (including Stetson St.) east to Lake Shore Drive. Location of Chicago's First Lady boat launch as well as a beautifully landscaped space that contrasts with the other districts while walking east towards the lakeshore. This area also includes a restaurant, Cyrano's and a residential community: Lakeshore East. At State and Wabash Streets where the Riverwalk is at its widest is the Vietnam Veterans Memorial Plaza, commemorating events that took place during that war. Designed by Ross Barney Architects and built in 2005, it is nestled within the Riverwalk and consists of a terraced lawn, a waterfall and a central pool.The Chicago Vietnam Veterans' Memorial Plaza, one of the largest in the nation outside of Washington, D.C., connects people to the riverfront, provides an escape from the steel and glass of the City, and bejewels the City's waterfront. Its public objectives and finished forms embody what a memorial plaza should be; a remembrance of those that served, and a celebration of the living. The plaza occupies land, reclaimed by the rebuilding and relocation of Wacker Drive, to create an urban park, with terraces and bench-lined ramps that gently transition from busy city streets to more quiet spaces near the river, providing a green refuge. Plans were announced to deploy the full intention of a connected path from Lake Michigan west towards Lake Street. Ross Barney Architects was again charged with envisioning this extension. Phase 01 was completed in 2009 with under-bridge canopies and new landscaping added south of State Street. On October 8, 2012, Mayor Rahm Emanuel unveiled plans for an addition to the Riverwalk, extending it another six blocks along Chicago's River from State to Lake streets. Phases Two and Three of the Riverwalk, a collaborative design effort between Sasaki and Ross Barney Architects, links a series of six distinct civic spaces or "rooms", each named for its unique program. Floating gardens, a bridge and fishing piers will aim to create more recreational options for the city's "Second Lakefront," and connect the downtown area. As of early summer 2015, three of the rooms will be finished, completing Phase Two: the Marina (food vendors and seating to watch watercraft), the Cove (boating and kayak rentals), and the River Theater (amphitheater seating and a link to Upper Wacker Drive). Phase Three, the final three blocks, is planned to be completed by the end of 2016. In June 2015, The Marina Plaza, The Cove, and The River Theater sections of the Riverwalk from State Street to LaSalle Street was officially opened. The City has been working on the development plan for the Chicago Riverwalk since the 1990s. During the reconstruction of East-West Wacker Drive, the roadway was reconfigured to allow greater public access to the river. The City received Congressional approval to redefine the navigational channel allowing the build-out of the path 20 feet under each bridge and 25 feet between each bridge and 50 feet between Franklin and Lake Street in order to extend the Riverwalk. The City obtained $98 million for design engineering and construction from the U.S. Department of Transportation through the Transportation Infrastructure Finance and Innovation Act). The remaining phase along the south bank of the river from Lake Street to State Street will connect to the previously completed section of the Riverwalk. In October 2016, The Water Plaza, The Jetty, and The Boardwalk sections from LaSalle Street to Lake Street opened to the public. The city is planning a $10M renovation of the Riverwalk east of State Street. The oldest section of the walk, Riverwalk East will see improvements like new landscaping, seating, play areas, and walkways. The Marina Plaza: This area provides restaurants, outdoor seating, and boat access. The Cove: This area Provides access for docking of human-powered crafts such as Kayaks and canoes. The River Theater: This area has a sculptural staircase linking Upper Wacker Drive and the Riverwalk. It has seating and is shaded by trees. The Water Plaza: Originally named the Swimming Hole, this area features a zero-depth fountain. The Jetty: This area has s series of piers and floating wetland gardens. It offers an interactive learning environment about the ecology of the river, including opportunities for fishing and identifying native plants. The Boardwalk: This area is an accessible walkway and lawn area and has continuous access to Lake Street. ^ Kamin, Blair. "Cityscapes: City's second waterfront: Riverwalk improved, but hurdles remain". Chicago Tribune. Retrieved 3 October 2012. ^ "Chicago Riverwalk". City of Chicago. Retrieved 3 October 2012. ^ Allen, Daniel (2017-05-01). "Chicago Riverwalk open for business (and pleasure)". CNN Travel. Retrieved 2018-02-09. ^ "Chicago Riverwalk". Chicago Architecture Foundation. Retrieved 2018-06-13. ^ "Chicago Riverwalk Main Branch Framework Plan". City of Chicago. Retrieved 3 October 2012. ^ "Civic District". City of Chicago. Retrieved 3 October 2012. ^ "Market District". City of Chicago. Retrieved 3 October 2012. ^ "Riverwalk". Blog. A View on Cities. Retrieved 3 October 2012. ^ Stephen, Phyllis (October 5, 2009). "Riverwalk Completion in Chicago Ties Up 100 Years of Plans", World Architecture News. Retrieved July 6, 2015. ^ a b Balde, Lisa (October 8, 2012). "Chicago Unveils Riverwalk Expansion Plans", NBC Chicago. Retrieved July 6, 2015. 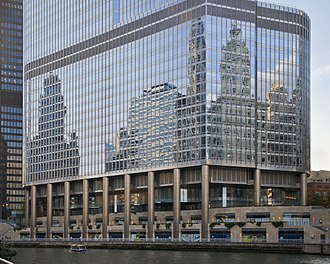 ^ "Sasaki and Ross Barney Architects complete Chicago Riverwalk -". World Landscape Architecture. 2016-12-03. Retrieved 2017-08-10. ^ "Chicago Riverwalk Construction", Riverwalk Expansion. Retrieved July 6, 2015. ^ Sisson, Patrick (2016-10-24). "Chicago's new Riverwalk offers a vision of the future of urban parks". Curbed. Retrieved 2017-08-10. ^ Isaacs, Deanna (July 1, 2015). "Like Rahm's Riverwalk, the Chicago River's Still a Work in Progress", Chicago Reader. Retrieved July 6, 2015. 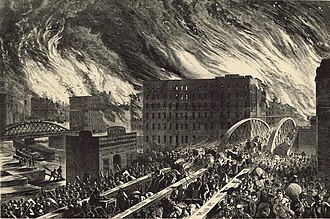 Wikimedia Commons has media related to Chicago Riverwalk. 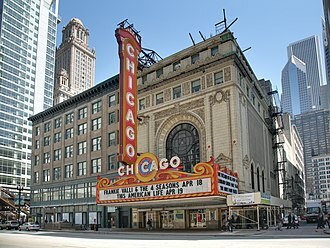 The culture of Chicago, Illinois is known for the invention or significant advancement of several performing arts, including improvisational comedy, house music, gospel and soul. The city is known for its Chicago School and Prairie School architecture, the city is additionally known for various popular culinary dishes, including deep-dish pizza, the Chicago-style hot dog and the Italian beef sandwich. Chicago lays claim to a number of regional specialties that reflect the citys ethnic. Included among these are its nationally renowned deep-dish pizza, this style is said to have originated at Pizzeria Uno, the Chicago-style thin crust is popular in the city. A number of well-known chefs have had restaurants in Chicago, including Charlie Trotter, Rick Tramonto, Grant Achatz, in 2003, Robb Report named Chicago the countrys most exceptional dining destination and in 2008, Maxim awarded Chicago the title of Tastiest City. Chicago-style pizza is deep-dish pizza with an outer crust and large amounts of cheese. Similar to this is stuffed pizza, with more cheese, topped with a second. Thin-crust pizza is very popular in Chicago. The Italian beef, a sandwich featuring thinly sliced roast beef simmered in a broth containing Italian-style seasonings, most beef stands offer a cheesy beef option, which is typically the addition of a slice of provolone or mozzarella. A combo is a sandwich with the addition of grilled Italian sausage. Italian beef sandwiches are traditionally topped with sweet peppers or spicy giardiniera, shrimp DeJonghe, a casserole of whole peeled shrimp blanketed in soft, sherry-laced bread crumbs. Maxwell Street Polish, named after Maxwell Street where it was first sold and its a Polish sausage made with beef and pork, and with garlic and other spices, served on a bun with grilled onions. A francheezie is a variation of the Chicago-style hot dog, the hot dog is wrapped in bacon and deep-fried, and either stuffed or topped with cheese. The jibarito is a specialty sandwich that originated in the heart of Chicagos Puerto Rican community, the mother-in-law is a tamale on a hot dog bun, topped with chili. 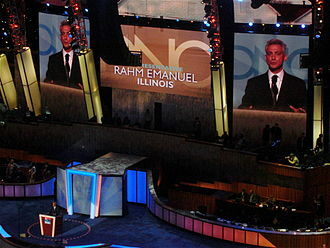 Rahm Israel Emanuel is an American politician who is the 44th mayor of Chicago. 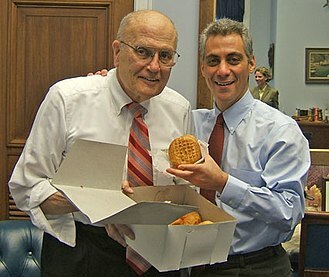 A member of the Democratic Party, Emanuel was elected in 2011 and he was re-elected on April 7,2015. Born in Chicago, Emanuel is a graduate of Sarah Lawrence College, working early in his career in Democratic politics, Emanuel was appointed as director of the finance committee for Bill Clintons 1992 presidential campaign. Beginning a career in finance, Emanuel worked at the investment bank Wasserstein Perella & Co. from 1998 for 2½ years and served on the board of directors of Freddie Mac. In 2002, Emanuel ran for a seat in the U. S. House of Representatives vacated by Rod Blagojevich, Emanuel won the first of three terms representing Illinoiss 5th congressional district, a seat he held from 2003 to 2009. 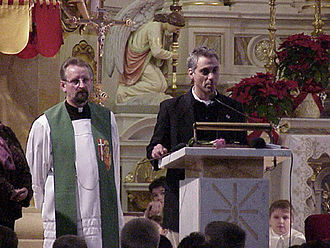 After the 2008 presidential election, President Barack Obama appointed Emanuel to serve as White House chief of staff, in October 2010, Emanuel resigned as chief of staff to run as a candidate in Chicagos 2011 mayoral election. Emanuel won with 55% of the vote over five candidates in the nonpartisan mayoral election. Although Emanuel did not obtain a majority in the February 2015 mayoral election. In early December the federal Justice Department announced an investigation into the operations of the Chicago police department, Emanuels grandfather was a Romanian Jew from Bessarabia. The surname Emanuel, which means God with us, was adopted by their family in honor of his fathers brother Emanuel Auerbach, Emanuels parents met during the 1950s in Chicago. Emanuel was born on November 29,1959 in Chicago and his first name, Rahm means high or lofty in Hebrew. He has been described by his older brother Ezekiel, an oncologist and bioethicist at the University of Pennsylvania, as quiet and observant as a child. 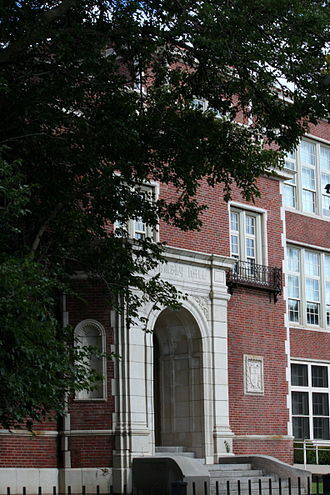 Ari, the youngest, is the co-CEO of William Morris Endeavor, while he lived in Chicago, Emanuel attended the Bernard Zell Anshe Emet Day School. After his family moved to Wilmette, north of the city, Emanuel attended public schools, Romona School, Locust Junior High School and he and his brothers attended summer camp in Israel, including the summer following the June 1967 Six-Day War. Lake Shore Drive is an expressway running parallel with and alongside the shoreline of Lake Michigan through Chicago, Illinois, USA. Except for the north of Foster Avenue, Lake Shore Drive is designated as part of U. S. Highway 41. From the Chicago River south to 57th Street was named Leif Ericson Drive in 1927, the roadway was nicknamed Field Boulevard. The entire road was named Lake Shore Drive in 1946, Lake Shore Drives origins date back to Potter Palmer, who coerced the city to build the street adjacent to his lakefront property to enhance its value. Palmer built his castle at 1350 N, the drive was originally intended for leisurely strolls for the wealthy in their carriages, but as the auto age dawned it took on a different role completely. In 1937, the double-decker Link Bridge over the Chicago River opened, along with viaducts over rail yards, the lower level was intended for a railroad connection, but it was never used until LSD was rebuilt in 1986. At the time the bridge was built, it was the longest and widest bascule bridge in the world, the Lake Shore Drive and Link Bridge Photograph Album, c1937, documents the bridges construction. The album is held by the Ryerson & Burnham Libraries at the Art Institute of Chicago, North of the river, LSD intersected Ohio Street at grade, and passed over Grand Avenue and Illinois Street on its way to the bridge South of the river. LSD came from the south on its current alignment, but continued straight at the north of Monroe Street. It intersected Randolph Street at grade and continued north above the Illinois Central Railroads yard, at the river, it made a sharp turn to the right, and another sharp turn to the left onto the bridge. This reverse curve was known locally as the S-Curve or the S-Turn, the landfill used for the 1930s extension was mostly dirt, but the 1950s extension included rubble and debris from the destruction of homes razed for the construction of the Congress Expressway. Portions of the drive between Irving Park Road and Foster Avenue still contain the original concrete from the 1930s, Sheridan Road south of Foster narrows to 2 lanes of traffic with street parking on each side as well. Wolf Point is the location at the confluence of the North and Main Branches of the Chicago River in the present day Near North Side and Near West Side community areas of Chicago. This fork in the river is important in the development of early Chicago. This was the location of Chicagos first three taverns, its first hotel, Sauganash Hotel, its first ferry, its first drug store, its first church, and the first bridges across the Chicago River. 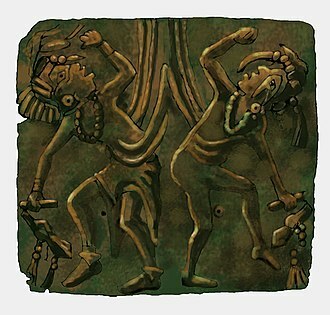 The name is said to derive from a Native American Chief whose name translated to wolf. Historically, the west bank of the river at the fork was called Wolf Point, but in the 1820s and 1830s it came to denote the entire area, the origin of the name, Wolf Point, is unknown. In her 1856 memoir Wau-Bun, Juliette Kinzie states that the place was called Wolf Point, from its having been the residence of an Indian named Moa-way, the first non-indigenous settler at Wolf Point may have been a trader named Guarie. Hubbard wrote that De Champs had shown him evidence of a trading house, james Kinzie, the son of early settler John Kinzie, built a tavern on the west bank of the river at Wolf Point in 1828. By 1829 this tavern was operated for Kinzie by Archibald Caldwell who was granted a license on December 8 of that year. Caldwell left Chicago early in 1830 and Elijah Wentworth became the landlord of the tavern and he was in turn succeeded by Charles Taylor and William Walters. The tavern became known as the Wolf Point Tavern or Wolf Tavern, in about 1829, Samuel Miller and his brother John opened a store on the north bank of the river at the forks. 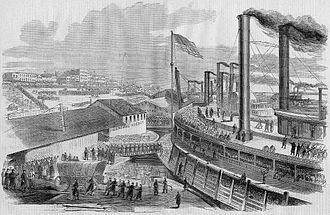 In 1830, they enlarged their store and began to operate it as a tavern in competition with the Wolf Point Tavern, on June 2,1829 Samuel Miller and Archibald Clybourn had been authorized to operate the first ferry across the Chicago River. Clybourn was the man, crossing the North Branch of the river between Millers tavern and the Wolf Point Tavern. In 1831 John Miller built a log house near his brothers tavern that he used as a tannery, Samuel Miller sold the tavern and moved away following the death of his wife in 1832. Mark Beaubien opened the Eagle Exchange Tavern in a log cabin on the bank in 1829. The Trump International Hotel and Tower, known as Trump Tower Chicago and Trump Tower, is a skyscraper condo-hotel in downtown Chicago, Illinois. The building, named after businessman and current President of the United States, Donald Trump, was designed by architect Adrian Smith of Skidmore and Merrill. Bovis Lend Lease built the 98-story structure, which reaches a height of 1,388 feet including its spire and it is next to the main branch of the Chicago River, with a view of the entry to Lake Michigan beyond a series of bridges over the river. 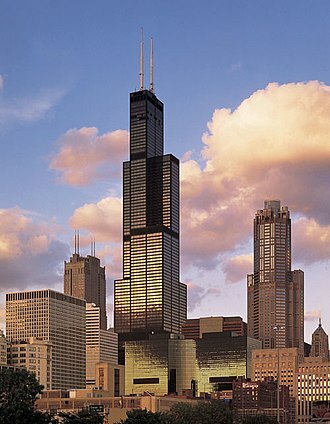 When topped out in 2009, it became the fourth-tallest building in the US and it surpassed the citys John Hancock Center as the building with the highest residence in the world, and held this title until the completion of the Burj Khalifa. The design of the building includes, from the ground up, retail space, a parking garage, the 339-room hotel opened for business with limited accommodations and services on January 30,2008, full accommodation and services on April 28. A restaurant on the 16th floor, opened in early 2008 to favorable reviews, the building topped out in late 2008 and construction was completed in 2009. As of 2015, the hotel is three in Chicago with an elite five-star Forbes Travel Guide rating. It hosts a restaurant that is one of three five-star Forbes-rated restaurants in the city and a spa that is one of six that is at least a four-star Forbes-rated in the Chicago area in 2015. Sixteen is one of five restaurants in Chicago with at least a Michelin Guide two-star rating in 2016, the tower sits at 401 North Wabash Avenue in the River North Gallery District, part of the Near North Side community area of Chicago. The building is across the Chicago River from the Chicago Loop and it is a block away from the southern end of the Magnificent Mile portion of Michigan Avenue. The restaurant, has a view of the Chicago Rivers entrance to Lake Michigan. The design of the building incorporates three setback features designed to provide continuity with the surrounding skyline, each reflecting the height of a nearby building. The third setback, on the east side, relates to 330 North Wabash building, some views distort the alignment of the second setback. 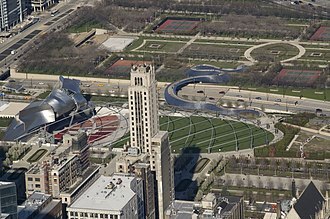 Chicago, Illinois is a major center for music in the midwestern United States where distinctive forms of blues, and house music, a genre of electronic dance music, were developed. The Great Migration of poor workers from the South into the industrial cities brought traditional jazz and blues music to the city, resulting in Chicago blues. Notable blues artists included Muddy Waters, Junior Wells, Howlin Wolf and both Sonny Boy Williamsons, jazz greats included Nat King Cole, Gene Ammons, Benny Goodman, Chicago is well known for its soul music. In the early 1930s, Gospel music began to gain popularity in Chicago due to Thomas A. Dorseys contributions at Pilgrim Baptist Church, in the 1980s and 1990s, heavy rock and hip hop became popular in Chicago. Orchestras in Chicago include the Chicago Symphony Orchestra, the Lyric Opera of Chicago, Chicagos music scene has been well known for its blues music for many years. Chicago blues is known for its heavy rolling bass, Chicago is one of the places where the faster, juicier boogie-woogie emerged from the blues. House music originated in a Chicago nightclub called The Warehouse, Chicago house is the earliest style of house music. While the origins of the house music are unclear, the most popular belief is that it can be traced to the name of that club. DJ Frankie Knuckles originally popularized house music while working at The Warehouse, House music was developed in the houses and clubs of Chicago, and was initially for local club-goers in the underground club scenes, rather than for widespread commercial release. As a result, the recordings were much more conceptual, the distinctive Chicago style of jazz originated in southern musicians moving North after 1917, bringing with them the New Orleans Dixieland or sometimes called hot jazz styles. King Oliver and Jelly Roll Morton became stars of the Chicago jazz scene, Louis Armstrongs recordings with his Chicago-based Louis Armstrong and his Hot Five and Hot Seven band came out in the years 1925 to 1928. These recordings marked the transition of original New Orleans jazz to a sophisticated type of American improvised music with more emphasis on solo choruses instead of just little solo breaks. Chicago and its suburbs, which together comprise the Chicago Metropolitan Area, is home to 29 Fortune 500 companies and is a transportation and distribution center. Manufacturing, publishing and food processing play roles in the citys economy. The total economic output of Chicago in GMP totaled US$547B in 2012 making Chicago the 21st largest economy in the world just surpassing the total output of Switzerland. The central downtown area has experienced a resurgence, in contrast to recent years, with construction of new condominium. These include the 92-story Trump Tower Chicago, Lakeshore East development, since the recession, other projects, like the planned 150-story 2000 foot Chicago Spire by architect Santiago Calatrava, have now been cancelled. Many city neighborhoods are gentrifying at a pace as well, including Humboldt Park, Logan Square, Uptown, Near Southside. The massive expansion of OHare International Airport and recently reconstructed Dan Ryan Expressway will shape development patterns for years to come, Home prices in Chicago advanced 7. 8% in March 2013 over March 2012 The city houses one of the Federal Reserve Banks, established in 1914. There is the Federal Home Loan Bank of Chicago, the largest banks in the Chicago region are, JPMorgan Chase, Bank of America, BMO Harris Bank, and Northern Trust. The largest banks headquartered in Chicago are, Northern Trust, Chase, BMO Harris Bank, Wintrust Financial, many financial institutions are in the Loop. Chicago has five major financial exchanges, including the Chicago Stock Exchange, the Chicago Board Options Exchange, the Chicago Mercantile Exchange, the Chicago Board of Trade, and NYSE Arca. While the city of Chicago houses most of the brokerage firms, many insurance companies are in the city or suburbs. According to Reboot Illinois, the largest employers in the city of Chicago are, Before it was incorporated as a town in 1833 and it quickly became known for its ruthless practice of buying out or destroying the competition, as most private traders in Chicago soon found out. It appointed John Kinzie and Antoine Deschamps as its first agents in northern Illinois and their field of operations covered northeastern Illinois and the Illinois River. Columbus Drive is a north-south street in Chicago, Illinois which bisects Grant Park. It is 300 East in Chicagos street numbering system and its south end is an interchange with Lake Shore Drive at Soldier Field. After intersecting Illinois Street, it becomes Fairbanks Court and continues to the north, in the Illinois Center development, the main lanes of Columbus Drive are on the middle deck of a three-level structure. That level intersects with the levels of Randolph Street, Lake Street, South Water Street. All these intersecting streets exist on the lower and upper levels, except for Lake, North of the river, it intersects the upper level of North Water Street and passes over that roads lower level before descending to ground level just before reaching Illinois Street. Columbus originally only went south from Monroe Street, south of Illinois Center, in 1980, it was extended to Wacker, including the three-level portion, and it was built over the Chicago River in 1982, connecting to Fairbanks Court. Crime in Chicago has been tracked by the Chicago Police Departments Bureau of Records since the beginning of the 20th century. The citys overall crime rate, especially the violent crime rate, is higher than the US average. Chicago was responsible for half of 2016s increase in homicides in the US. As of 2017, Chicagos homicide rate is higher when compared to the larger American cities of New York and Los Angeles. The reason for the violence which is localized to areas of the city, including change in police tactics or increase in gang rivalry. Chicago saw a rise in violent crime starting in the late 1960s. After 1992, the count decreased to 641 murders. The population was 2,799,000 in 1999, so the reduction was slow, in 2002, Chicago had fewer murders but a significantly higher murder rate than New York or Los Angeles. Chicago experienced a rise in violent crime starting in the late 1960s, a decline in overall crime in the 2000s. Murder and robbery are common violent crimes in the city, and this murder rate of 15.65 per 100,000 population is still above the U. S. average, an average which takes in many small towns and suburbs. 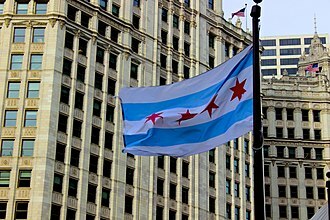 Chicagos homicide rate had surpassed that of Los Angeles by 2010, by the end of 2015, Chicagos homicide rate would rise to 18.6 per 100,000. By 2016, Chicago had recorded more homicides and shooting victims than New York City, Chicagos biggest criminal justice challenges have not changed much over the last 50 years, and statistically reside with homicide, armed robbery, gang violence, and aggravated battery. He replaced interim superintendent, John Escalante, according to the 2011 Homicide Report released by the Chicago Police Department, the murder clearance rate has dropped from over 70% for 1991 to under 34% for 2011. By 2016, Chicagos murder clearance rate had dropped to only 21%, a Chicago Magazine article further pointed out that, in Chicago, people are quite literally getting away with murder. 76.3 percent of victims had a prior arrest history. Warmer months have significantly higher rates, and over 70% of murders take place between 7PM and 5AM. In 2011, 83% of murders involved a firearm, and 6. 4% were the result of a stabbing, 10% of murders in 2011 were the result of an armed robbery and at least 60% were gang or gang narcotics altercations. Roads and expressways in Chicago summarizes the main thoroughfares and the numbering system used in Chicago and its surrounding suburbs. Chicagos streets were laid out in a grid that grew from the original townsite plan. Streets following the Public Land Survey System section lines became arterial streets in outlying sections, as new additions to the city were platted, city ordinance required them to be laid out with eight streets to the mile in one direction and 16 in the other direction. A scattering of diagonal streets, many of them originally Indian trails, many additional diagonal streets were recommended in the Plan of Chicago, but only the extension of Ogden Avenue was ever constructed. In the 1950s and 1960s, a network of superhighways was built radiating from the city center, as the city grew and annexed adjacent towns, problems arose with duplicate street names and a confusing numbering system based on the Chicago River. On June 22,1908, the city adopted a system proposed by Edward P.
Brennan. The changes were effective September 1,1909 for most of the city, addresses in Chicago and some suburbs are numbered outward from baselines at State Street, which runs north and south, and Madison Street, which runs east and west. A book was published in 1909 by The Chicago Directory Company indexing the old and this volume is available on line in pdf format indexed by initial letter, Plan of Re-Numbering, City of Chicago, August 1909. 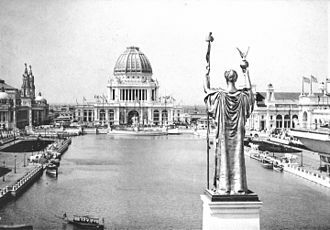 The downtown area did not conform to this system until April 1,1911, downtown was defined as Lake Michigan on the east, Roosevelt Road on the south, and the Chicago River on the north and west. The addition to downtown was published, and is on line as a pdf indexed by downtown street name. This additional paragraph explained the changes, The 1909 address change did not affect downtown Chicago. The ordinance was amended June 20,1910 to include the downtown area, the new addresses for the “loop” went into use on April 1,1911. Chicago house numbers are assigned at the rate of 800 to a mile. LaSalle Street is a major north-south street in Chicago named for Sieur de La Salle, an early explorer of Illinois. The portion that runs through the Chicago Loop is considered to be Chicagos financial district, South of the Financial District, LaSalle Street gets cut off for a while by the Amtrak/Metra Rail yard from Taylor St to 1600 South. It runs parallel to the Rock Island District Metra line, South of 26th Street, it serves as a frontage road for the Dan Ryan Expressway until 47th street, where it merges with Wentworth Avenue. South of 47th, it starts and stops as a street until it finally terminates at West 147th Street in Riverdale. The stretch of LaSalle Street and its adjacent buildings in the Loop is recognized as the West Loop—LaSalle Street Historic District, the south end of LaSalle Street terminates at the art-deco Chicago Board of Trade Building, a Chicago Landmark and National Historic Landmark. The LaSalle Street Station commuter terminal is located south of the Board of Trade. An art deco skyscraper at 135 S. LaSalle and a modern skyscraper 190 S. LaSalle line the street, one North LaSalle, the former Field Building, Chicago City Hall and the James R. Thompson Center are located within the Loop on LaSalle Street. 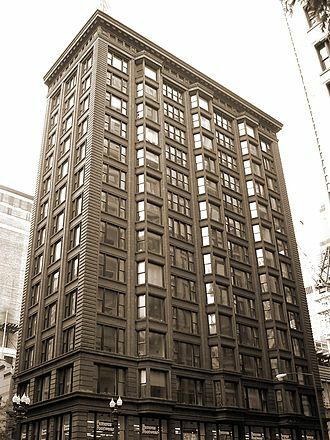 The Rookery Building is a landmark located at 219 South LaSalle Street. Completed by John Wellborn Root and Daniel Burnham of Burnham and Root in 1888 and it measures 181 feet, is twelve stories tall and is one of the oldest standing high-rises in Chicago. It has a style with exterior load-bearing walls and an interior steel frame. Closed in 1906, the tunnel was deepened and reopened to electric street car traffic in 1911-12, the tunnel was closed permanently in 1939 to make way for subway construction. Moving north from the Loop, the crosses the Chicago River using the La Salle Street Bridge. In the Near North Side,300 North LaSalle is located on the banks of the Chicago River. On the corner at Chicago Avenue, LaSalle is adjacent to the entrance of Moody Bible Institute, the street ends 10-blocks north, in Lincoln Park, just past its intersection with North Avenue, where Moody Church stands on the east side of LaSalle. Lakeshore East is a master-planned mixed use urban development being built by the Magellan Development Group in the Loop community area of Chicago in Cook County, United States. It is located in the part of the Loop, which. The development is bordered by Wacker Drive to the north, Columbus Drive to the west, Lake Shore Drive to the east, Owings & Merrill created the master plan for the area. The development, which had scheduled for completion in 2011, is now set for completion in 2013. Lakeshore East features several of the tallest buildings in Chicago and may include a few of the tallest buildings in the United States, the overall planned development, the park, and several of the individual buildings have won awards for architecture and/or urban planning. The buildings are planned for various types of residential use, due to the neighborhoods proximity to both Lake Michigan to the east and the Chicago River to the north, many of the buildings are named with aquatic or nautical themes. As of August 2008,1,500 condominiums have been sold and 1,200 apartments have been completed, previous to this urban development, the Lakeshore East area had been used by Illinois Central Railroad yards. After World War II, the railroads sold airspace rights north of Randolph Street, for several years after the rail yards were vacated, the site was used as a 9-hole golf course. Pete Dye designed the course, known as Metro Golf at Illinois Center, the solution was to stagger ground-level amenities and building entrances from the upper level at the perimeter to the lower level at the interior. Thus the multilevel street grid is utilized around the edges, with large parking structures in the podiums, a 27-floor vertical expansion of the Blue Cross Blue Shield Tower was completed in 2010. 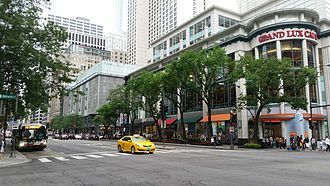 When Harbor Point and 400 East Randolph were built, Lake Shore Drive ran through this neighborhood to the west of these buildings, the Chicago Pedway, which has existed since 1951, connects to public and private buildings, Chicago Transit Authority stations and Metra commuter rail facilities. The 4,6 and 60 CTA bus routes run along the borders of the Lakeshore East area, the archives available on the NewEastside. Michigan Avenue Bridge across the Chicago River. 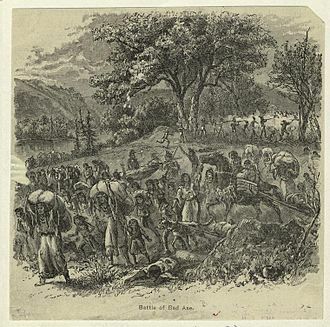 Fort Dearborn depicted as in 1831, sketched 1850s although the accuracy of the sketch was debated soon after it appeared. The riverfront pavilion in Ping Tom Memorial Park. The southwestern entrance into Portage Park at the intersection of Irving Park Rd. and Central Ave.
Kosciuszko Park is located by the intersection of Diversey and Pulaski. Children returning to class following a fire drill at a Chicago elementary school, 1973. Photo by John H. White. Wrigley Field is the home of the Chicago Cubs. Guaranteed Rate Field, home of the White Sox. 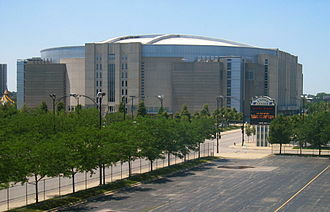 The United Center is the home of the Chicago Bulls and Chicago Blackhawks. Soldier Field is the home of the Bears. CPD working a murder crime scene in Englewood. Quantitative scholarly report that documents the history of Chicago's corruption. Clock tower as seen from Trump International Hotel and Tower's restaurant, "Sixteen"
SOM's original three partners — Louis Skidmore, Nathaniel Owings and John O. Merrill.